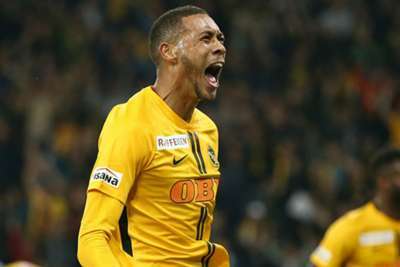 Guillaume Hoarau scored Young Boys' first Champions League goal as the Swiss side came from behind to deny Valencia in a 1-1 draw at Stade de Suisse. Both teams came into the game without a goal to their name in Group H, but Michy Batshuayi's second of the season gave Valencia a first-half lead. Veteran striker Hoarau struck from the spot 10 minutes into the second half, and Champions League debutants Young Boys looked like the more likely side to grab a winner. Sekou Sanogo saw a late header turned on to the post for Young Boys, the result leaving both sides without a victory after three games, with Manchester United hosting Juventus in the group's other game later on Tuesday. Miralem Sulejmani's swerving free-kick for the hosts was comfortably saved by Neto in the only notable chance of the early stages, before Valencia moved ahead after 26 minutes. To conclude a neat passing move, Carlos Soler's flicked pass released Batshuayi, who took two touches to breeze past goalkeeper Marco Wolfli's rush from the line and side-foot into the empty net from six yards. Young Boys made a fast start after the break with Christian Fassnacht's header saved by a sprawling Neto and Kevin Mbabu firing wide from a presentable chance. And they were awarded a penalty when Djibril Sow was felled by a rash challenge from Valencia captain Dani Parejo, Hoarau sending Neto the wrong way with a low spot-kick. It took a good Neto stop to deny a Fassnacht strike on the break, while substitute Moumi Ngamaleu had a header saved as Young Boys finished strongly. And the hosts thought they had a famous win with two minutes remaining, only for Neto to somehow tip Sanogo's header onto the post. While Young Boys will be thrilled with their opening Champions League point, it will not boost the morale of Valencia, who have now drawn six of their last seven games in all competitions, and won only one of the last nine. In a game of two halves, Valencia controlled the pace of the game prior to the interval, but barely threatened as an attacking force after that. Having secured a creditable draw at Old Trafford on matchday two, this will go down as a huge missed opportunity to gain ground on the two teams above them in the race to reach the last 16. When all is said and done, these dropped points could prove to be decisive for Marcelino. Kevin Mbabu's energy from right back typified the spirit shown by Young Boys in the second half. The 23-year-old was an impressive force at both ends of the pitch, creating three chances in the game – more than anyone else on the pitch – and touching the ball more than anyone else. Parejo flopped in the first Champions League game of the season against Juventus, conceding a penalty with a wild high boot on former team-mate Joao Cancelo, and going on to miss a spot-kick himself late in that game. He did not get close to winning the ball when challenging Sow in the area here, a mistake which handed Young Boys a breakthrough and completely changed the momentum of the game. The midfielder also failed to create a single chance in the whole game. - Young Boys have lost just one of their four home games against Spanish opponents in European competition (W2 D1), with that only defeat coming against Athletic Bilbao in August 2009 in a Europa League qualifier (1-2). - Valencia are winless in their last six games in the Champions League (D2 L4); their joint-longest run without a victory in the competition (also six games in October 2011). - Michy Batshuayi's opener ended a run of 494 minutes since Valencia's last goal in the Champions League, having gone five games without scoring prior to tonight’s game. - Young Boys netted their first ever goal in the Champions League, with what was their 34th shot of the 2018-19 tournament. Valencia are away to Athletic Bilbao in LaLiga on Saturday, while Young Boys will look for a first win in five games at home to Sion on the same day. The two teams meet again in matchday four of this competition on November 7 at Mestalla, a game that has to be must-win for the Spanish team.